Judy Garland (born Frances Ethel Gumm; June 10, 1922 - June 22, 1969) was an Academy Award-nominated American film actress and singer, best known for her role as Dorothy Gale. Her poignant performance and sweet delivery of Over The Rainbow, which became her signature song, earned Judy a special juvenile Oscar statuette on 29th February 1940 for Best Performance by a Juvenile Actor. Though Judy Garland was some peoples first choice to play Dorothy other executives wanted Shirley Temple because of her star power. At the time Shirley Temple was under contract to 20th Century Fox. MGM tried to borough her but Darryl Zanuck refused. A year later 20th Century Fox starred Shirley Temple in their own fantasy film, Maeterlinck's The Blue Bird, which was a failure and marked the begining of the end of Shirley Temples career. Unable to acquire Shirley Temple the studio began promoting Judy Garland via tours and stage performances. She was given top billing in 1938's Listen, Darling over better known actors of the time such as Mary Astor, Gene Lockhart and Walter Pidgeon. On June 22, 1969, Garland was found dead by her last husband, Mickey Deans, in the bathroom of her rented Chelsea, London house. Coroner Gavin Thursdon stated that the cause of death was accidental overdose of barbiturates; her blood contained the equivalent of ten 1.5-grain Seconal capsules. Garland had turned 47 just over a week prior to her death. Frank Morgan (June 1, 1890 – September 18, 1949) was an American character actor best known for his portrayal of the title character in the 1939 film The Wizard of Oz. Frank Morgan was not the first choice to play the Wizard, nor was he the second or third choice, he went after the role after it was offered and turned down by both Ed Wynn and W. C. Fields. The role was conceived in different ways for each actor as a boisterous con man for Fields, emotional and zany for Ed Wynn and finally as the familiar frightened and befuddled humbug of a Wizard played by Frank Morgan. The befuddlement was genuine as Morgan was known to be a drinker. Because of the success of his role, which only amounts to a few minutes of actual screen time, Frank Morgan was given a lifetime contract with MGM and went on to make sixty eight films before dying in his sleep after suffering from a heart attack at the age of fifty nine. Ray Bolger (January 10, 1904 – January 15, 1987) was an American entertainer of stage and screen, best known for his portrayal of the Scarecrow (and the farm worker "Hunk") who was Dorothy's favorite in the 1939 film, The Wizard of Oz. Ray Bolger was originally cast in the role of the Tin Woodsman but he was dissatisfied. Bolger saw himself in the more fluid role of the Scarecrow, the part played by Fred A. Stone in 1902, an idol of his from the time he saw him in Jack O' Lantern at a theater in Boston. The role of the Scarecrow had originally been given to Buddy Ebsen who had begun costume fittings and dance rehearsals for the role before Ray Bolger's insistence finally wore down the studio heads. Ray Bolger died of bladder cancer on January 15, 1987 (five days after his 83rd birthday) in Los Angeles, California. Jack Haley (born John Joseph Haley, Jr.; August 10, 1898 – June 6, 1979) was an American film actor best known for his portrayal of the Tin Man and farm worker Hickory in The Wizard of Oz. Ray Bolger was originally cast as the Tin Woodsman but after convincing the studios to switch him to the role of the Scarecrow it was given to fellow contract actor Buddy Ebsen who was originally cast as the Scarecrow. Buddy Ebsen was not opposed to the switch as his only concern was to be in a major production, unfortunately this was not fated for the actor. Two weeks after production began he had an almost fatal from inhaling the aluminum powder makeup. Though he recovered and went on to out live all of the major actors in The Wizard of Oz his career went into a slump until 1956 when he appeared in Disney's Davey Crocket. Jack Haley was given the role as the Tin Man after Ebsen was hospitalized and the studio quietly change the make up to a paste, to avoid risking the same reaction by Haley. The new makeup did cause an eye infection which caused Haley to miss four days of filming, but he received treatment in time to prevent permanent damage. Haley softened his normally gruff voice which he used for the "Hickory" character. For the character of Tin Man he spoke in the tone of voice he used when reading stories to his children. Haley died of a heart attack on June 6, 1979 in Los Angeles, California at the age of 80. Buddy Ebsen outlived him by twenty four years. Bert Lahr, born Irving Lahrheim, (August 13, 1895 – December 4, 1967) was a Tony Award-winning American comic actor. Born in New York City, he is best remembered today for his role as the Cowardly Lion (and the farm worker "Zeke") in The Wizard of Oz, but known during his life for a career in burlesque, vaudeville and Broadway. Before Burt Lahr was chosen for the role of the Cowardly Lion the character was intended to be that of an enchanted prince. When the character was rewritten to be that of an ordinary lion (at least ordinary for Oz) it was believed that Burt Lahr with his gentle sweetness and enormous comic energy had the ability to carry the figurative and literal weight (it weighed 70 pounds) of the lion costume. The role of the Cowardly Lion was one of the few on screen chances that Burt Lahr had to fully exploit his immeasurable talent. Though perfect for the role it took a month for the studio to agree to Burt Lahr demand for a guarantee of five weeks work. Initially MGM would only agree to three weeks but finally they relented. Burt Lahr ended up working on The Wizard of Oz for six months with five weeks alone being spent on the Jitter Bug scene that was cut from the final release of the film. In 1967, Lahr died of pneumonia in New York City in the middle of filming The Night They Raided Minsky's, forcing producers to use a double in several scenes. Fittingly, this last role was as a burlesque comic. Margaret Hamilton (December 9, 1902 - May 16, 1985) was an American film actress best known for her iconic portrayal of The Wicked Witch of the West and Miss Gulch in The Wizard of Oz. Gale Sondergaard was originally cast in the role of The Wicked Witch. Mervyn LeRoy had envisioned her as a glamorous, seductively wicked witch wearing a black sequined dress and hat, a character similar to that of the wicked queen in Disney's Snow White. Outside pressure forced a change in character from the glamorous witch to the evil and ugly witch famously portrayed by Margaret Hamilton who took the role when Sondergaard refused to have herself made ugly. Margaret Hamilton's name was passed along for consideration since she fit the character and the budget for the role. After a screen test negotiations began for the role but as with Burt Lahr initially MGM was only willing to guarantee three weeks work and not the six demanded by her agent. Margaret herself begged her agent to give in and not lose her the role but he held fast and the studio relented. She worked on The Wizard of Oz for four months. During a second (and unused) take of her fiery exit from Munchkinland, in which the trap door's drop was delayed to eliminate the brief glimpse of it seen in the final edit, Margaret Hamilton suffered severe second and third degree burns. She had to recuperate in a hospital and at home for six weeks after the accident before returning to the set to complete her work on the film. When she returned Hamilton refused to have anything to do with fire or to do the scene where she flies a broomstick billowing smoke. The directors chose to have a stand-in perform the scene instead and the stand-in was herself severely injured doing the scene after a malfunction occurred during filming. Hamilton lived in New York City for most of her adult life. Her Gramercy Park apartment building also claimed James Cagney as one of its tenants. She later moved to Salisbury, Connecticut, where she died in 1985 following a heart attack. She was 82 years old. Mary William Ethelbert Appleton "Billie" Burke (August 7, 1884 – May 14, 1970) was an Oscar-nominated American actress primarily known to modern audiences for her role as Glinda the Good Witch of the North. Billie Burke was everyone's first choice from among the contracted character actresses suitable for the role. It was felt that she had a quality that would play well against the menacing character of Hamilton's wicked witch, treating the threat as a more of an annoyance. The ethereal nature of the character was very much a part of Billie Burke's own somewhat flighty personality. Billie Burke died in Los Angeles, California of dementia, thought to be Alzheimer's and natural causes, aged 85, in 1970. Charles E. Grapewin (December 20, 1869 – February 2, 1956) was an American vaudeville performer and a stage and film character actor, perhaps best known for his portrayal of Uncle Henry. Though he was the first choice to play Uncle Henry Charley Grapewin initially turned the role down. He had already appeared in more than 70 films, including Listen, Darling with Judy Garland the year before, and he was looking to retire from show business. Several months later, though, Charles Grapewin agreed to postpone his retirement and accepted the role. The filming of the Kansas scenes took just one week but Grapewin still worked to make his portrayal of the old Kansas farmer authentic. According to The Making of The Wizard of Oz by Aljean Harmetz, "Grapewin wore the underwear that was standard for Westerns, two-piece balbriggan underwear with five buttons on the side. It was felt that balbriggan underwear added character to the clothes worn over it." Grapewin died in Corona, California at age 86. Clara Blandick (June 4, 1880 – April 15, 1962) was a twentieth century American actress best known for her portrayal of Auntie Em. MGM went outside the studio for the character of Auntie Em because they felt that the part was too minor for one of there contract actors. Clara Blandick landed the part which was her most memorable minor role. Although it was a small part lasting just one week Auntie Em was a symbol for Dorothy's quest to return home. The character's of Auntie Em and Uncle Henry are the only ones that don't have alter egos in the land of oz though it's thought that Auntie Em's character was to be reflected in the character of The Good Witch of the North. Even though the character of Auntie Em as portrayed by Clara Blandick is well known her name wasn't as it was not listed in the opening credits and listed last in the closing credits. Blandick's health began to fail during the 50's. She started going blind and began suffering from severe arthritis. On April 15, 1962, Clara Blandick returned home from Palm Sunday services at her church. She began rearranging her room, placing her favorite photos and memorabilia in prominent places. She laid out her resume and a collection of press clippings from her lengthy career. She dressed immaculately, in an elegant royal blue dressing gown. With her hair properly styled, she took an overdose of sleeping pills. She lay down on a couch, covered herself with a gold blanket over her shoulders and tied a plastic bag over her head. Clara left the following note: "I am now about to make the great adventure. I cannot endure this agonizing pain any longer. It is all over my body. Neither can I face the impending blindness. I pray the Lord my soul to take. Amen." Terry the Dog was a Cairn terrier trained by Carl Spitz who also trained the St. Bernard that starred with Clark Gable And Loretta Young in The Call Of The Wild. Though referred to as a male in the film Terry was a female terrier acquired by Spitz four years before the making of the Wizard of Oz. The search for a dog that resembled Toto as drawn by W.W. Denslow in the original book took longer then the search for any other actor. Spitz had been hired to train Terry who was so shy that she hid under a bed for three weeks. It took seven weeks to train Terry but when her breeder could not come up with money to pay for the training Carl Spitz decided to keep her. When Spitz heard about the search for Toto and saw the illustration he recognized the breed and brought Terry to the studio. Unfortunately for Carl he stopped at the Property Department before meeting with the writers and producers and had already agreed to a salary of $125.00 per week. Had he realized earlier how desperate MGM was for the dog he could possibly have gotten up to $500.00. Like other members of the cast Terry was also injured during production when one of the Winkie guards jumped on her and sprained the dogs paw. Richard Thorpe began directing The Wizard of Oz on October 12, 1938 and was fired two weeks later because it was felt that he did not have the sensibility to direct a fantasy film. He is credited with the decision to dress Judy Garland in a curly blonde wig and make-up that made her appear to be in her late teens and not as an innocent young farm girl. 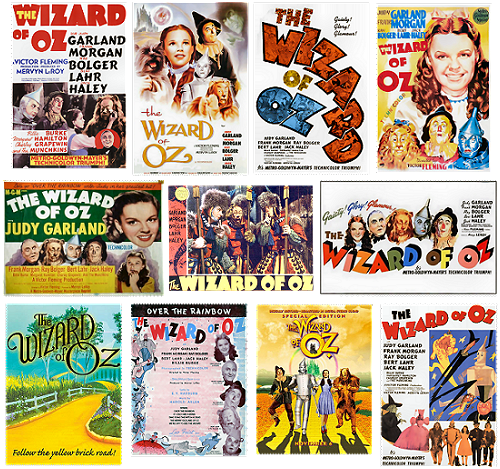 All the film that was shot during Thorpe's direction, which centered around the witch's castle and Dorothy's rescue was thrown out when the studio changed directors. The actors were disheartened by the studio's reaction to their work during this time as they were berated for their performance though they were only following direction. With each change of director came the fear of being replaced. Though George Cukor was the director for only three days (he was scheduled to direct Gone With The Wind) and shot no film footage he made some notable changes to the characters. After viewing the film shot by Thorpe he was appalled by Judy Garland's appearance and performance. It was his decision to remove the blonde wig and most of the make-up that she wore. He also directed her to be herself and not to act in an overly cute fashion. Victor Flemming took over as director after George Cukor left to direct Gone With The Wind. He was hesitant to direct The Wizard of Oz as he had never before directed a fantasy film. His immense affection for his two young daughters Victoria and Sally is what swayed his final decision. Flemming directed the majority of the film, all except the Kansas scenes. As far as actual directing and contributions to the film it was Flemming who brought in writer John Lee Mahin. Flemming wasn't happy with the opening scene of The Wizard of Oz which had Dorothy barely concerned about Miss Gulch and her threat against Toto. Mahin changed the scene to show a more realistic agitated and frightened Dorothy. He also came up with the story line of the damaged incubator in order to explain Uncle Henry's and Aunt Em's dismissal of Dorothy's concerns. Victor Flemming couldn't do much to change or direct the Oz characters as most of the acting was physical and the actors were left to themselves but he could direct Judy Garland and he did. He followed Cukor's direction and kept the cuteness out of her performance. Dorothy's performance is what drives the film and grounds tethers the fantasy to keep it believable. Flemming left The Wizard of Oz to again replace George Cukor when he was fired from Gone With The Wind. He is credited with directing both films though he completed neither. King Vidor was going to take over directing Gone With The Wind but he was saved from the undertaking when Selznick made a deal with MGM to get Victor Flemming, which left Vidor the finish directing The Wizard of Oz. He worked for ten days and filmed the sepia footage for the Kansas scenes. His contribution to the film was in the directing of Judy Garland during the singing of Over The Rainbow. People normally stood still when singing but he had Judy walk around as she sang the now well known ballad. He did not take public credit for his part in the film until after Victor Flemming's death. The Wizard of Oz premiered in August of 1939 at the Strand Theater in Wisconsin, Grauman's Chinese Theater in Hollywood and Loew's Capitol Theater in New York. For the first week Judy Garland performed live with Mickey Rooney after each screening. The nation wide opening was on August 25, 1939. The Wizard of Oz earned 3 million dollars and cost 3.8 million to make. The film was nominated for several Academy Awards upon its release, including Best Picture and Academy Award for Visual Effects. It lost the award in the Best Picture category to Gone with the Wind (another MGM release), but won in the category of Best Song (Over The Rainbow) and Academy Award for Best Original Score, which went to, not the songwriters, but Herbert Stothart, who composed the background score. Re-released ten years later in 1949 The Wizard of Oz earned another 1.5 million finally showing a profit. From 1949 until 1990 the Kansas scenes were shown in black and white rather then the original sepia which was restored for the VHS release. In 1955 the film was again released, this time in an artificial wide screen format achieved by removing portions from the top and bottom of the film. This format was used again in the 1998 release but the film was restored for the VHS and DVD releases. CBS televised The Wizard of Oz for the first time on November 3, 1956. Though the film was shown and advertised as being in black and white and color most people viewed the movie in black and white since color televisions were not as common then. It is estimated that forty five million people viewed the original broadcast. Three years later the film was shown again as a Christmas special and was viewed by an even larger audience which started. The Wizard of Oz was televised as a Christmas special for the next three years until 1962. In 1964 the film was shown early in the year and continued to be shown once a year for the more then two decades. The film is now shown several times a year on various stations. The Wizard of Oz was released on VHS in 1980, on laserdisc in 1989 and on DVD in 1997. For more information visit Wikipedia's The Wizard of Oz (1939 film), or read The Making of The Wizard of Oz by Aljean Harmetz, (November, 1977) ISBN 0-7868-8352-9. Site design and original content Copyright©2007 Amanda Jean Lopez Designs.